According to the Department of Transportation, there is a 23 percent increase in holiday travel during the month of December, both among truckers and other travelers. FedEx says it will ship a record 317 million packages between Black Friday and Christmas Eve—an increase of 12.4 percent from 2014. While the holidays are joyous and full of excitement, holidays can also be stressful times. Holiday shopping, errands and driving significant distances to spend the holidays with family members can all contribute to this stress. If you work as a truck driver, the holiday season means tighter schedules, increased levels of work, and even more stress than usual. 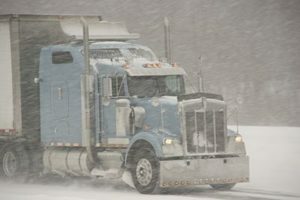 These extra shipments of Christmas gifts and toys increase the number of truckers on the highways, and the weather is typically worse than normal during this time period, with ice and snow creating extra hazards for truckers. Placing over-extended, stressed-out truck drivers on the roadways with other stressed-out, fatigued drivers is a recipe for holiday trucking accidents. In addition to the many holiday stresses, there are also more impaired drivers on the roadways during the holiday season. Illnesses are also more common during this time as stress, fatigue and colder temperatures increase the likelihood of drivers being on the road with a cold or the flu. With additional pressures at worker, those who are ill may drag themselves to work despite feeling bad. Certain medications can affect driving performance, making the driver drowsy or slowing response time. The combination of these factors leads to as many as 400 car accident fatalities on Christmas day alone every year in the U.S. Trucking companies hire extra seasonal workers in order to help with the busy shipping season, getting the hundreds of thousands of extra packages where they are going, on time. Unfortunately, not all trucking companies make sure these temporary truck drivers are properly trained and that a full background check has been performed. The results can be improperly loaded cargo or insufficiently trained drivers, leading to a potentially fatal collision. According to the Washington Post, the United States Postal Service delivers more than 600 million packages during the holiday season, with similar numbers among UPS and FedEx truck drivers. UPS and FedEx trucking accidents have steadily increased each year, with an increased 10 percent risk of an accident during the month of December for large commercial trucks. Driver fatigue is certainly a factor in the upswing in large commercial and delivery truck accidents which occur during the holiday season. While the maximum number of working hours was reduced in 2011 to 70 hours within a seven-day period, many drivers continue to exceed these limits, particularly during the holiday season. Truck drivers don’t get paid unless they are behind the wheel of their truck, driving. The families of truck drivers depend on the extra money made by the drivers during the holiday season for their own Christmas expenses. This leaves many truckers driving while fatigued or drowsy. Some drivers have been known to use methamphetamine or “speed” to stay awake and alert during the long hours spend driving. Unfortunately, while these drugs may keep the driver awake, they also affect reaction times and ability to focus on the road. Of course truck drivers and trucking companies need to ensure the safety of all drivers on the road, particularly during the holiday season. It is helpful for the drivers of passenger vehicles to remember that trucks require a large amount of space to stop, and that every driver of a large commercial truck has blind spots which prevent him from seeing a much smaller passenger car. Avoid the truck’s blind spots, and make sure you leave plenty of room between yourself and a large truck, particularly in inclement weather. Making this holiday season a safe one for everyone on the roadways should be a top priority for truckers, trucking companies and everyone who drives during the holiday season. When you or someone you love has been injured in a trucking accident, it is imperative that you seek legal counsel immediately. Injuries that are sustained in a trucking accident are usually severe and may require a lifetime of care. Contact the experienced Colorado Springs personal injury attorneys at the Green Law Firm today to schedule a no-obligation consultation and discuss your case. Call us today at 1-719-694-8515.